Info The Honorable Paul D. Pate was sworn in as the 55th Mayor of Cedar Rapids Iowa in January 2002. He is currently serving his second term. He is also leading more than 870 of Iowa’s cities in a focus on modernizing the state’s property tax system on which cities, counties and schools are funded as President of the Iowa League of Cities (www.iowaleague.org). His additional leadership includes serving as Co-Chair of the US Conference of Mayors (www.usmayors.org) Hunger and Homelessness Task Force. Mayor Pate’s key initiatives for this city of over 122,000 include economic development, affordable and accessible housing through neighborhood development, user-friendly government and fiscal responsibility. Mayor Pate brings legislative, state executive and business expertise to his position as Mayor. He served four years as Iowa Secretary of State where his leadership included Commissioner of Elections and Vice Chairman of the Iowa Executive Council. As Secretary of State, he chaired the Jobs Coalition for Main Street Iowa program designed to identify and eliminate specific government burdens on small businesses. 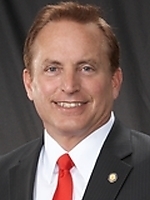 Mayor Pate also served six years as Iowa State Senator representing the Cedar Rapids area. In the Iowa Senate, he chaired the Intermediate Criminal Sanctions Joint Legislative Committee to develop programs to ensure safe cities, and served as Ranking Member of the Environment and Energy Committee, Transportation and Justice Appropriations. Mayor Pate brings business expertise to his elected leadership role from serving as President and CEO of Pate Asphalt Systems, a company he founded in 1981. He previously served as Executive Director for the youth entrepreneurship program of East Central Iowa. He has been recognized as Iowa Young Entrepreneur of the Year by the SBA, with a Blue Chip Award by the United States Chamber of Commerce, and an Outstanding Community Leader by The Des Moines Register.